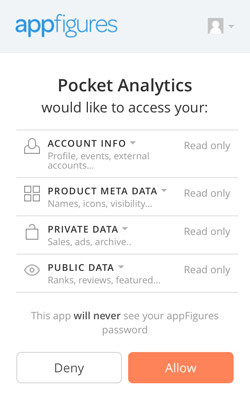 Pocket Analytics provides support for the appFigures API - giving you instant access to your sales and download data for your apps. 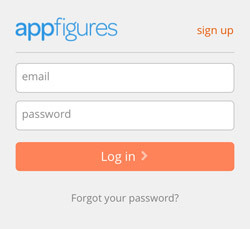 appFigures uses OAuth to authenticate users of their API. This means that we will open a web browser within Pocket Analytics where you can log in to appFigures. You will then be asked to grant Pocket Analytics read-only access to your data. All meta data is encrypted on the device, and never sent anywhere. Once permission is granted, appFigures will provide an Access Token to Pocket Analytics, which will be used in all future communication to retrieve data from appFigures. If you edit your apps in appFigures (i.e. add/remove an app), just come back to the account, and tap "Refresh Account Profiles...". All communication with the appFigures API is encrypted using https. All sensitive information is encrypted on the the device.